My New Project! (a web endurance racing game). It's gonna take a while, but I'm learning the tools and will make it happen eventually. 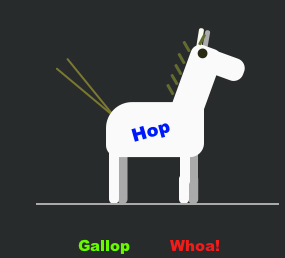 Click on this image to go to a page with my first html5 horses! Way too cool!!! Love it. I am looking forward to your progress. Have a friend who did a Flash animation--just a stationary horse moving in the environment so not as sophisticated as your project--of the Olympic dressage diving competitor. Dressage rider and horse, with suitable, hysterically funny narration, bounced up and down on a diving board, jumped into the pool and received high scores for style and form. I adored it--think it's on my old computer somewhere. Who knows, you may start an equine animation game revolution!